Exotissimo’s head office, Travel Agency & Exo Thailand all based in central Bangkok announce their move to a new location that will benefit its worldwide staff, clients and customers. 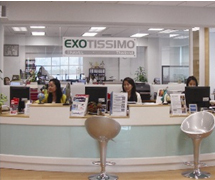 Leading Destination Management Company, Exotissimo Travel, are excited to announce their move and signing of a lease for improved and larger office space on Sathorn Road, Silom, Bangkok to accommodate the amalgamation of their head office, Exo Thailand and the Travel Agency. The move from their current office will take place in early June 2011 and reflects Exo’s commitment to remain based within the heart of Asia, continuing to offer inspirational travel experiences while working closely with people based in the countries where they offer tours. The superior office space is an indicator of the continued growth of Exo over recent years. The new offices will allow for expansion and improvement of the services offered. Improved amenities will make it easier to accommodate management from the seven destinations they offer tours in and strengthen the companies close working relations. The new address will be 22nd Floor, Smooth Life Tower, 44 North Sathorn Road, Silom, Bangkok, 10500. Strategically well positioned it allows easy access from transport links and is a welcoming place for our clients. Exotissimo Travel is a premier destination management company that specializes in tailor made tours in Vietnam, Cambodia, Laos, Myanmar, Thailand, Indonesia and Japan.